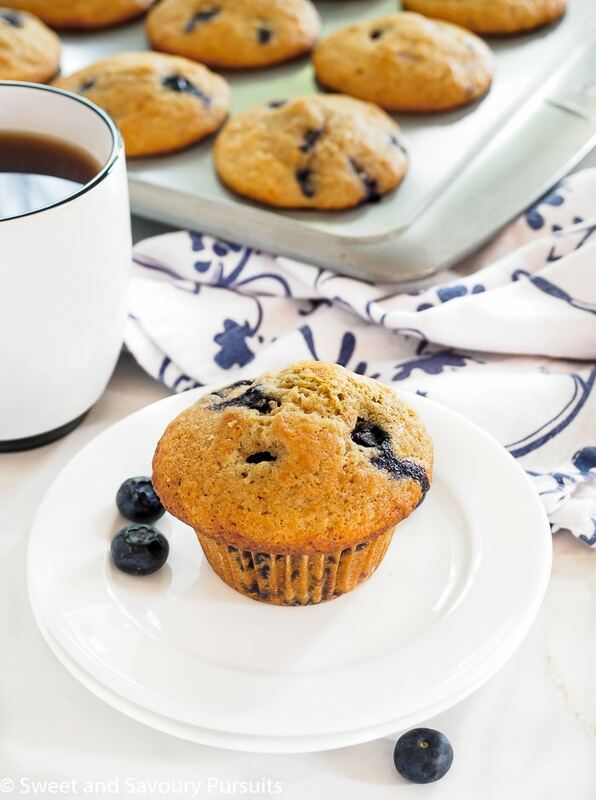 Tender and moist, these heavenly whole wheat blueberry lemon muffins are simple to bake and make a wonderful breakfast treat or snack. 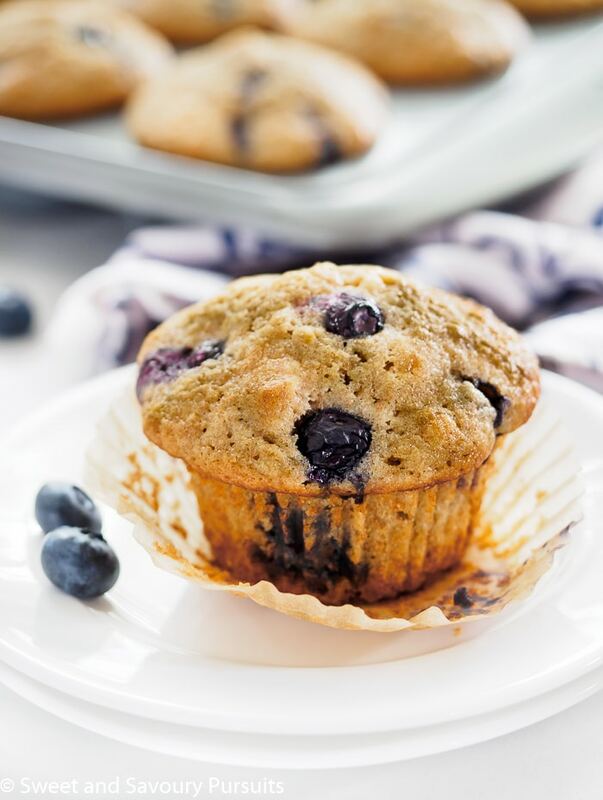 One bite into these heavenly blueberry muffins will convince you that you don’t need any fussy crumb topping to have delicious muffins. These simple whole wheat blueberry lemon muffins are delicious just as is and bake up beautifully every time. Using a combination whole-wheat pastry flour and all-purpose flour keeps these muffins nice and light while adding some extra fibre, minerals and antioxidants. 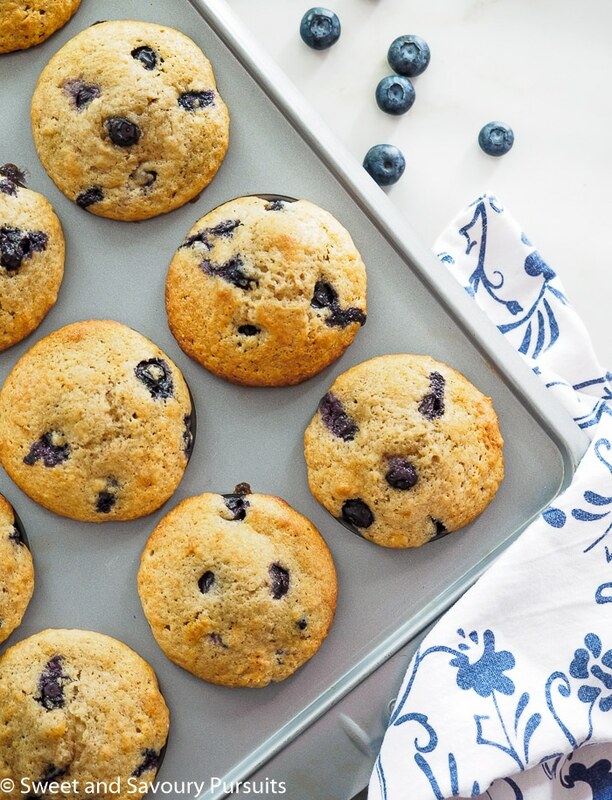 Nutritious and high in antioxidants, fresh blueberries add pockets of juicy goodness to these lightly sweetened muffins and the added lemon zest makes these muffins taste summery fresh. These whole wheat blueberry lemon muffins are still fresh and delicious a couple of days after baking. Keep them fresh longer by storing them in the freezer to enjoy later. This recipe is adapted from Fine Cooking, you can take a look at the original here. In a large bowl, whisk together the whole-wheat pastry flour, all purpose flour, baking powder, salt and baking soda. In a separate bowl, whisk the sugar, butter and eggs until mixture is well combined. Add the milk, yogurt, lemon zest and vanilla extract and whisk together until smooth. Add the dry ingredients to the wet mixture and fold batter with rubber spatula until almost combined. Add the blueberries to the batter and gently fold in. Do not overmix as it causes the muffins to be tough. Spoon the batter into the greased or paper-lined muffin cups dividing the batter evenly over the 12 muffin cups. Bake for 18 to 20 minutes or until muffins are golden and a toothpick inserted inside comes out clean or with a few crumbs. Store the muffins in an airtight container at room temperature for two days. For longer storage keep the muffins in the fridge. You can also freeze them for later consumption. Great recipe thought not enough lemon for me. I might added more zest and some juice the next time. Hi Anita, sorry you didn’t find the muffins lemony enough to your taste, but luckily that’s an easy fix, adding more lemon zest should do the trick! I LOVE blueberry muffins – in fact, I just had one this morning 😉 The addition of lemon just sends these over the top! Love blueberry muffins as well. And blueberries and lemon are just perfect together! I love love love blueberry muffins! But lemon too? Heaven! They are gorgeous! Thanks Jess, I love baking with blueberries and lemon goes so well with blueberries I can’t help but add some lemony flavour in there! Mornings that start with muffins are just so much better than muffin-less mornings. I think that made sense. Either way, these look so gorgeous and so delicious! Yum! Perfect sense, I couldn’t agree more! Thanks so much Karly! These look really good, and they’re pretty, too! Love the blue and white colour scheme. Thanks so much Louise, hope you’re enjoying the sunshine! I love blueberry muffins and actually prefer without the crumb topping. I have never used whole wheat flour and lately have been using spelt in just about every recipe I make. I bet these would be awesome with spelt. They look amazing Fida. That’s great Suzanne, I’ve never used spelt before. I’m curious, do you mix it with all purpose flour or can you use it entirely on it’s own in a recipe? I usually mix it with other flours. My waffles are spelt, AP flour, oat and almond. You can use spelt alone or mix it. I like it so much better than whole wheat the flavor is nutty and mild and delicious. I think it would make an outstanding muffin. Sounds good, I’m going to pick some up and give it a try, it will make a nice change. Thanks Suzanne!